Born 9/14/92. 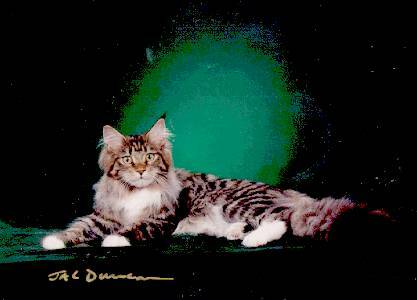 The TICA NW Region's 16th best longhair in 1993. Lindy is a good-sized, long-bodied female who throws huge kittens (her son Frosty is about 18 lbs at 1 year; another son, Charlie, is over 22 lbs. at 2 years). Lindy is a cold brown mctabby and white. Her muzzle and head are on the moderate side, but very square and strong, with a terrific chin and a clean scoopy profile. Lindy's ears are large, with large lynx tips; their set is good, though not as tight as most of our other cats. Her eyes are large and her expression is charming. Her hips are very good and her heart is sound (most recent ultrasound was in June 1997). Lindy is now retired from breeding and lives happily with her new owners in Seattle.